We frequently update BrainPOP websites and apps with new features and enhancements. You can find a monthly summary of our latest releases here. FYI is now Related Reading. Clever Integration: now offering Single Sign-On, easy rostering and automatic updates for BrainPOP, BrainPOP Jr. and BrainPOP ELL. Admin Dashboard improvements: refreshed school and district level dashboards provide enhanced usage data reporting features. District administrators can now upload districtwide CSV files of educator and student accounts. A fresh new look for BrainPOP, BrainPOP Español, BrainPOP Français, and BrainPOP Israel homepages. Now including block-based coding projects with Scratch on BrainPOP and BrainPOP Jr.
BrainPOP 101: A new interactive course that introduces BrainPOP features and tools to educators with individual My BrainPOP accounts. Student Assignment navigability improvements: Students can now see all of the parts of an Assignment on one landing page. Educator Assignment improvements: Educators can Copy Assignments and share in Google Classroom or Learning Management Systems. Admin Dashboard: now accessible on tablets, with a fresh look. Major improvements to CSV upload, including the ability to update existing accounts via CSV, and new individual teacher and student usage data. Movie Player: the Flash player on BrainPOP, BrainPOP Jr., BrainPOP Español and BrainPOP Français has been retired. Some users on older operating systems will be affected, and will see an alert message on our sites. Check our System Requirements for more information. Movie Player enhancements: You can now change the speed and resolution of movies, as well as stop and place the movies using your keyboard space bar. Help Center: Subscribers can find answers to common questions and product documentation for BrainPOP, BrainPOP Jr., and BrainPOP ELL in the new knowledge base. Students and teachers can now search and add backgrounds to Make-a-Movie scenes using the new backgrounds panel. Students and teachers can use the entire screen to draw and record sound in Make-a-Movie with new full-screen sound booth and drawing tools. Students can email ELL Quiz results to teachers. BrainPOP ELL is available on mobile devices: users can navigate directly to the site from any device. My BrainPOP compatibility: students can submit every feature to teachers. Content Index: helps teachers plan ELL lessons by providing scope, sequence and other useful information for each lesson, including grammar topics, reading and writing skills, and language functions. 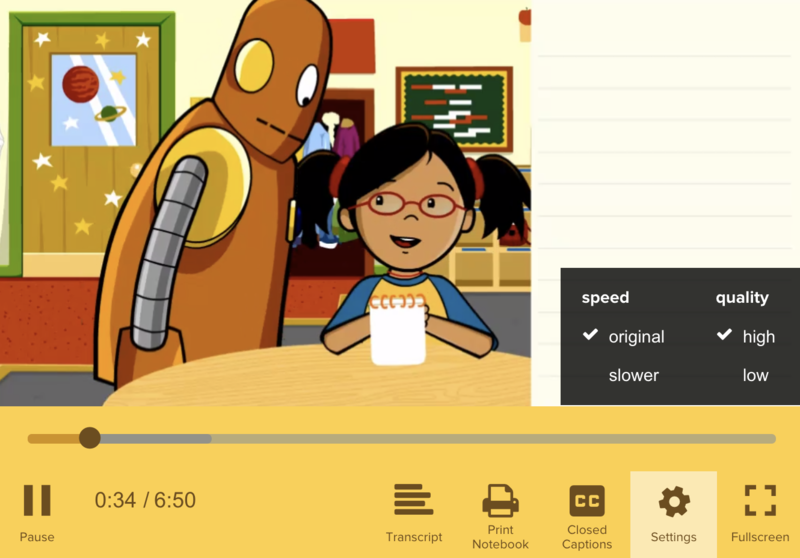 Accessible transcripts for BrainPOP ELL movies. Updated BrainPOP Educators ELL teaching resources. Canvas LTI tool enhancements: teachers can use a button in the Rich Text Editor to embed LTI topic links into Canvas assignments. A Course navigation link for quick single sign-on to the BrainPOP site has also been added. Better assignment navigation: Students who complete an assigned feature can return to Assignments View using the ‘Back To Assignment’ button. Teachers can download student-made movies. Any school can access our new Digital Citizenship Collection for free.